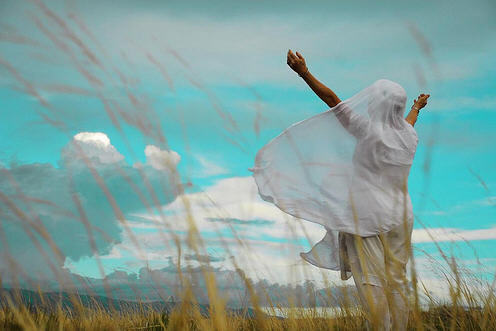 Often times people know my mother Sat Kirin Kaur and not me…and vice versa. "Oh…you’re Satkirin Kaur’s son, Really??". She is well known in her circles of western/spiritual chant music that often don’t cross over to my circles of the SikhNet web sangat. Since my mother was a teenager she has always been into music and when she became a Sikh in the early 70’s she naturally got into Gurbani Kirtan. I have many comforting memories as a child of her singing, particularly as I was drifting off to sleep. As I got older she started to learn & sing more classical style Kirtan. Back when we still lived in Los Angeles she used to play the shabad "Dhan Dhan Ram Das Guru"as a meditation for 2.5 hours every day for a period of 1,000 days. Gurbani has the power to heal a person at many levels (Spirital, Mental, Physical) and she was making full use of that for herself. My mother used to be one of the Guru Granthis for the Guru Ram Das Ashram Gurdwara and has always been immersed in the service and connection with the Guru. So, I think it was natural for her to take her love of music and Gurbani to share with others. I think all that devotion and love for the Guru got soaked into my being, and played a strong positive role in my life as a spiritual person. I think we often underestimate the impact that our parents (particularly the mothers) have on us as children. During the past 15 years or so my mother has taken her love of Gurbani and produced many audio CDs particularly geared towards a western audience (Fusion of East & Western style music). There are many full shabads, but the orientation for the music is typically a call and answer style format chanting specific short mantras from Gurbani. The idea was to provide simple tools for anyone (Sikh or not) to meditate with and uplift themselves. I have seen many people transform from listening to these CDs and getting introduced to Gurbani in this way. It is very accessible to people (especially those that are not Sikhs). Many don’t know much about the Sikhs but still benefit and change as a result of the Gurbani. My daughter Charanjeet Kaur always asks to listen to music by her "Ama Ji". She knows the music well. I often play one of my favorites to her which is great for falling asleep with (Aad Gureh Nameh). Every night after we read stories to the kids I do Kirtan Sohila along with other prayers to set them off to sleep. There is something special about bringing Gurbani to your children that creates secure & happy kids. 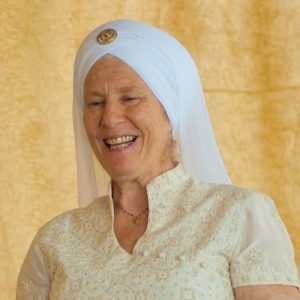 Here is a video about my mother Satkirin Kaur and introducing… "Mantra Medicine"
Your mother has very soothing voice. I enjoyed listening to her divine voice and it brings you closer to almighty. Her soul shines through in what she says, she seems as radiant as a person as her music is. Her music really touched my heart before but I never heard her talking, she seems very wise. I like her way of thinking. Please, send my gratitude and love for her fantastic music to her.